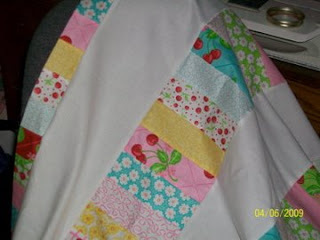 Quilting is my first love in the craft world. 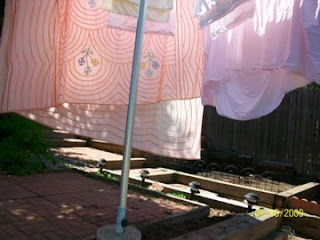 I have always enjoyed running fabric through a sewing machine. When things in my life get crazy I tend to run to my sewing room and make a quilt. last week was just such a week. Work was driving me crazy and a friend of my daughter died in an accident, sooo....to the sewing room and this is what I had made when I came out several hours later. I know most people go work out, run or eat, but not me. I sew a quilt! I saw a quilt similar to this on a friend to knit with. 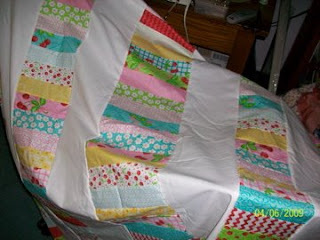 Normally, well always I am a traditional quilter. Yes I like all the "old" patterns. I do enjoy putting a "new twist" on some of the old patterns, but I do not care for "modern"quilts. Oh I enjoy looking at them but not making them. Quilts have to have a calming affect on me or I really do not care for it in my house. Yes I am a scrap quilter. I love cutting up fabric and sewing them back together. Weird but calming to me. Happy quilting to everyone. 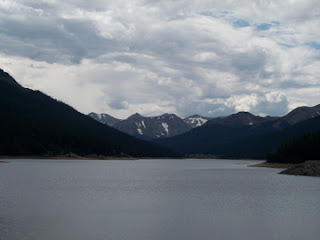 It is summer time and this is where I want to be... 10-thousand feet up in the mountains with family, moose ,river, and fish. We just wait for this trip every year. It is beautiful , calming and QUITE. I love the quite the most and of course the smell of the outdoors. 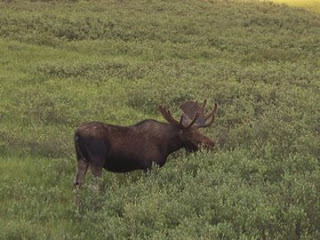 Here is Bullwinkle, remember that cartoon on Saturday morning way back in the day? And this is my fisherman. This man can catch fish anywhere and lots of them. 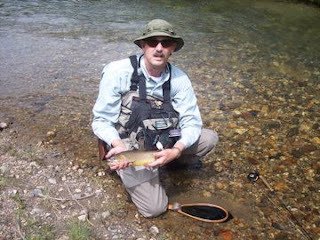 Of course he is a "catch and release" type of a guy. Sad but true ,we will probably not make it to our mountains this summer.We have a reservation for China. Yes if we are not detained due to the swine flu, we hope to be traveling in China with our daughter who is in the Peace Corps stationed in China. China presently is over reacting quarantining Americans coming into the country. Why they are not checking to be sure sick people do not get on the plane, they are waiting till you land and then checking for sick people. Makes no sense to me. 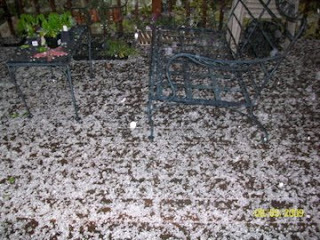 Thought I would show some pictures of the after math of the hail storms that have blown through here. 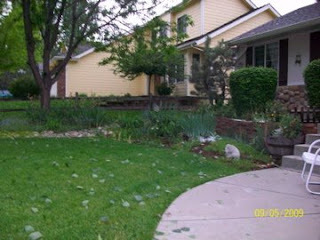 All the flowers are gone and the hostas are shredded. Oh well nothing I can do about this. 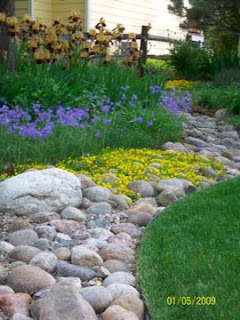 However, am not sure I will replant any of the annuals. Sad, but it was beautiful while it lasted. This is how farmers live every year and their crops are their livelihood, where my gardens are for pleasure. 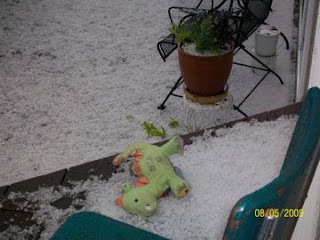 Could shovel the back deck, Maddies toy took a beating. The trees are stripped of leaves. With all the storms I have gotten allot of knitting done and with the upgrade with comcast I have been able to see several history shows involving WWII. I love history, something my parents instilled in their children. Summer vacations for us were tours of the Civil War battle fields and old towns on the east coast. Now I would give my eye teeth to able to walk through battle fields and old towns 3 weeks of the summer. Yes, I know you are sick of hearing about my rain days, but for the love of Mike they just keep coming. 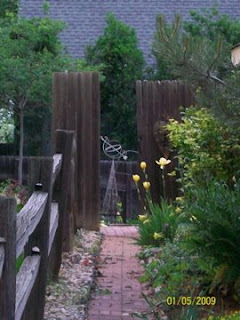 What was left in the garden is now very gone. 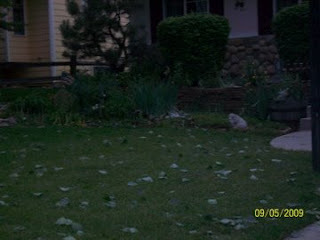 We have even had tornados in the foothills, very unusual. 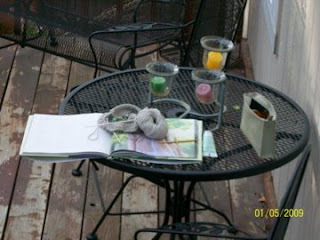 I was reading Skeins Her Way and she is having a wonderful give away. This one appealed to me because she is making me think as to what projects I want to get done this summer. I had to sit down and look at all the knitting projects I have on the needles and in my head. Mind you this is only knitting projects, not including my quilting goals. Well I let my brain smoke for a few minutes and the following is what I came up with. The first sweater will be for Erin and the one below for Caitlin. The colors are blue and a soft mustard, wool by Manos. I love the way Manos dyes her fibers, the colors are just what I consider a little "off" and muted. They always get me a bit exited, you know when your heart picks up a few extra beats. When this happens to me I know I have the perfect yarn and color. 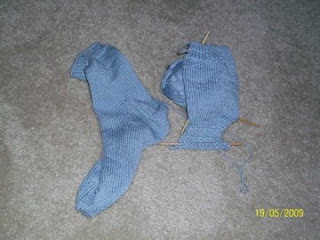 Also I want to finish these socks. A project so close but... not actually done. Hope you have some goals for the summer. Time does fly by and to have some goals on paper is a good reminder. 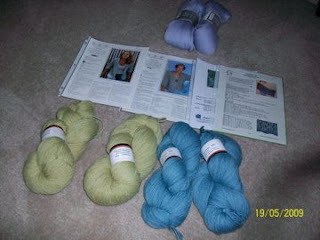 Thanks Skeins Her Way. Yup, again it is raining!! My garden is a disaster. 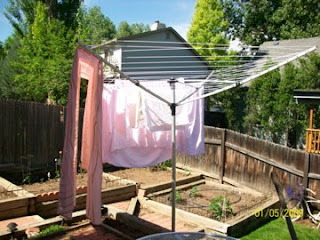 Oh how sad, I know the sun will come out eventually, I hope in time for the vegies to grow. I am so glad I took pictures before the BIG storm. 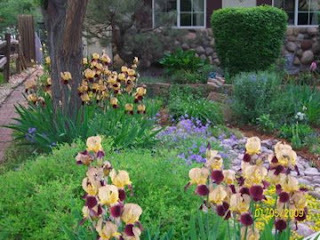 The flowers were beautiful, we loved sitting outside and just relaxing. But it was not meant to be for long. Instead we are inside watching movies. The Tudors has been great. A little scary that it seems the way people died back then was by execution. The heads were literally rolling...... 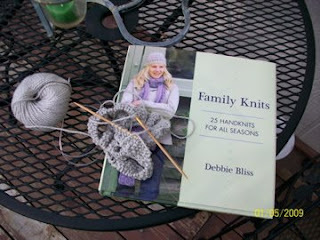 I am hooked, I am also getting knitting done since there is nothing to do outside. My gardens are looking great, I have enjoyed being outside( when it is not raining),weeding, planting and just hanging out on the porches knitting. It is cool but not cold and definitly not hot yet..Whawhoo! I do not enjoy hot weather anymore. I am trying a Debbie Bliss pattern with her cotton yarn. I love her patterns, the styles but she states to use a 6 US needle and to get her gauge I am using a 2.75US needle. Seems everyone I talk with has this same problem, what is this all about? Well I do think I will enjoy the sweater, it is very straight forward and a classical sweater. 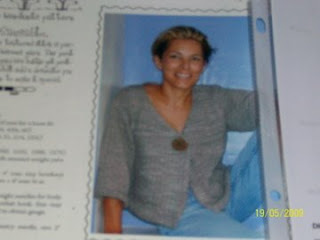 My daughter liked the pattern also, so am sure I will be making a couple of these sweaters.